The Crazy Bookworm does not usually spotlight Children's books on here. Although, I do read my fair share of them with my 3 year old niece! When I read the concept of this book, I simply could not pass it up! Not only did it sound like one that my niece would love, but one that I would like love as well! This book's wonderful word flow and beautiful illustrations make this book one that you will have no problem reading to that child in your life over and over again(because we all know kids love repetition!!) When asked "Again, Aunt Cathy" I happily obeyed! The book has the usually 'Rhyming' aspect that most Children's books have, but the author crafted it in such a way that the words lyrically flowed off the pages! The Snatchabook is such a wonderful concept. A book about sharing that delivers the moral of the story so uniquely. This is a book that should be added the bookshelves of every child. A beautiful tale that demonstrates greats views on sharing and caring. 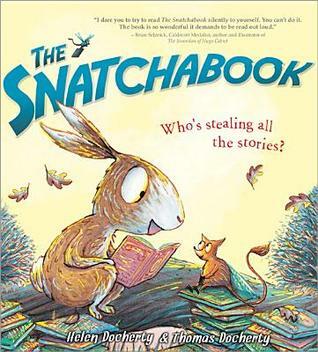 And don't be embarrassed if you are asking your child to read this one over and over again, because I can promise, you will not be alone when it comes to your love for The Snactchabook! I'm obsessed with childrens books. I can't go to that part of any bookstore because I'll go crazy, and my husband knows it. This cover drew me in from the first view, and your awesome review really helps. I'm going to keep my eye out for it! I picked up a copy of this book and a super sweet bag with the cover on it at BEA. I love the illustrations. It really reminds me of the kinds of books I loved as a child. Super cute! I enjoy mythic retelling although We have teat to read an adult version. Love your deal with of the guide!